Transceiver --- Please Select --- RFM95 (LoRa 868/915mhz) (stock: 161x) (+$12.00) RFM96 (LoRa 433mhz) (stock: 144x) (+$12.00) RFM69HCW - 433Mhz (stock: 97x) (+$7.00) RFM69HCW - 868/915Mhz (stock: 60x) (+$7.00) RFM69CW - 433Mhz (stock: 79x) (+$6.00) RFM69CW - 868/915Mhz (stock: 140x) (+$6.00) No transceiver! 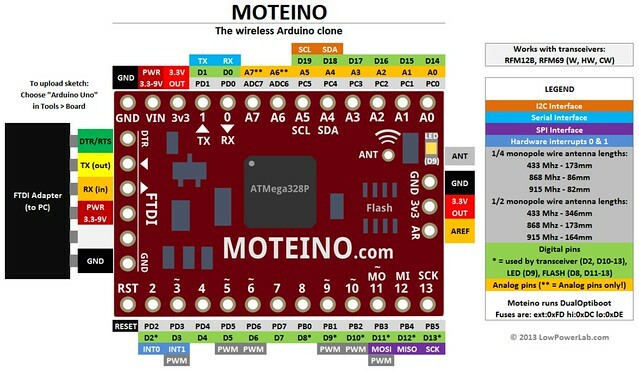 Moteino is a versatile low power Arduino based on the Atmel ATMega328P microcontroller. Please see the Moteino Guide for full specs and details. To make a wireless link you will need at least 2 Moteinos. Alternatively this is compatible with other Arduinos that use any RFM69 transceiver. DualOptiboot bootloader for fast programming and no delay startup. Choose Arduino Uno/Moteino under Tools>Boards from Arduino IDE. 4MBIT SPI Flash-MEM option: includes onboard SPI Flash chip, also available separately if you prefer to solder it yourself. This can be used for wireless programming or data logging. For more info see this link. RFM69HCW is a 20dBm transmit power transceiver, 130mA in TX, 16mA in RX. It's functionally (but not pin compatible) to RFM69HW. You will need to use the setHighPower() function after the initialize() function in the RFM69 library. See the examples that come with the library for how this is done. RFM69CW is a 13dBm transmit power transceiver, 45mA in TX, 16mA in RX. It's functionally (but not pin compatible) to RFM69W. RFM95/96 LoRa transceivers - 20dBm TX power, these can be used with the RadioHead library. NOTE: any RFM69 transceiver can communicate to any other RFM69 (regardless of pinout and variant). The RFM69Hxx radios (H = high power, 20dBm) require the setHighPower() function call after initialize. 433Mhz theoretically has slightly better obstacle penetration (vs higher frequencies) but likely shorter range in open air. You might need an amateur radio license to operate these depending on how much you transmit and transmit signal power (13-20dBm), please verify in your own region. there are no 868Mhz specific units offered, but will ship 915Mhz units for 868Mhz orders. Here is why: There is only 1 passive component value difference between the two versions and open air testing reveals no significant signal strength difference using 915Mhz units with 868Mhz settings. The RF behavior of Moteino is entirely dependent on the firmware you load on it, use it responsibly and abide with your local radio frequency laws and restrictions. Please be aware: not all frequencies are legal without a HAM license in all places. The library and example code may default to certain frequency/bitrate/output power settings, you are responsible to be compliant to your region's regulations. Moteino supports LoRa transceivers - a different radio technology that combines spread spectrum modulation and low bitrates to achieve very high sensitivity and consequently very long ranges. For more details and library support please visit the Moteino LoRa page. This forum thread reveals a 1.5mile range on RFM69 using a dipole antenna at 1.2kbps! You can upload a sketch to a Moteino just like you would normally do for any Arduino. In the Arduino programming environment you need to select "Arduino Uno" under Tools>Boards. You will need a FTDI USB-serial adapter to connect to the FTDI header. Other compatible examples are: FTDI cable, FTDI friend, USB BUB, etc. For all Moteino related blog entries click here. For example code and RFM69 library click here, and Github libary and examples are here. For example code and RFM12B library click here, and Github libary and examples are here. Also check the LowPowerLab blog for updates and other projects.